So, what got you involved as a BB leader in the first place? Rachael: It was the natural progression for me after my Queen’s Badge. I love the organisation and it was an opportunity to give something back to the community and watch future generations develop. Stuart: I had joined the BB as a young boy like many other leaders and when my time was up, I wanted to continue to be involved and to give something back to the BB. In most cases, being a leader doesn’t mean you can’t still have fun! How long have you served on the Brigade Executive? Rachael: I’ve been on the Executive for nine months so far – I’m still a ‘newbie’, but excited about what the future holds! Stuart: One year and a bit. What’s been the biggest surprise since you took on the role? Rachael: My biggest surprise would probably be how entertaining and interesting it is. My fear was that I would find it dull and boring, but I don’t! It’s great being involved in big decisions and having my voice (and those I represent) heard. Stuart: The amount of work that goes on behind the scenes to run the charity. As a Company leader I never imagined just how much is done to keep the BB going day-to-day. Away from Boys Brigade, how do you spend your free time? Stuart: Honestly, most of my free time is used doing lots of different BB activities, but I do enjoy hiking in the Scottish hills and travelling as well as ‘binge-watching’ TV shows now and again! Rachael: What free time?! No, I like to consider myself rather musical, playing the clarinet and piano. I also have a healthy relationship with Netflix! Some could say that having young trustees can be seen as a ‘tokenistic’. What’s your experience been? Is there any advice you would give other young people considering such a role? Stuart: The role is definitely not ‘tokenistic’. Whilst it can be overwhelming at your first meeting, you quickly feel welcome and a part of the group. 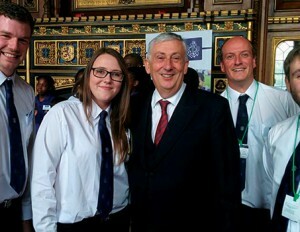 As a charity for young people, it’s great that young people are given the opportunity to influence how the BB is run. I’d tell anyone to give it a go and let your voice be heard! Rachael: I can see where these views come from and sometimes, I am tempted to agree. However, if you actively engage with what is going on and discussions that are being had, the advantages of having a young person’s point of view can be seen. I like to believe that I’m a young trustee for a reason and because I can bring something to the table, but I guess only time will tell. My advice to other young people considering the role would be that if you get stuck in and are willing to ask questions then go for it. Everyone is there to help you become the best version of yourself and to help grow this fantastic organisation. If you don’t understand something, just ask! You’re not going to know everything straight away and some people have gained their knowledge over numerous decades! What do you think the BB should do more of to encourage more youth participation? Rachael: Giving young people the opportunity to do more exciting activities like paintballing with their own age group is a way that I’ve seen an increase in youth participation in Manchester. We allow the young people to work together to decide and organise events that they want to do rather than those older Officers deciding for them. This model has seen retention rates of Seniors increase within Manchester and feedback from the young people reinforces how well this model works. Stuart: Put simply - give them more opportunities. Sometimes it’s easy to forget that in many cases it’s the young people who are closest to what’s happening and can come up with the best ideas. It might be frightening to trust young people but the results may surprise you. We recently let our Seniors plan and run an entire Company Section meeting and some of it was better than what we come up with! AND, finally… if you were on an overnight expedition, what essential food item would you take? Stuart: Would have to be a smoked sausage! Lots of flavour, hard to damage & doesn’t need refrigeration. What more could you want? Rachael: Frosties cereal bars … They’re basically what I survived on whilst doing my DofE!